No one has to tell you that divorce is hard. It’s a highly-emotional situation for everyone involved, even when you and your spouse agree that ending the marriage is the best option. 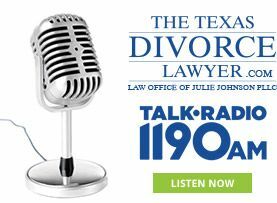 Dallas arbitration lawyer Julie Johnson helps couples like you navigate the difficult and life-changing process of divorce with minimum stress and disruption. Through arbitration you also avoid the time and expense involved in a traditional, court-based divorce proceeding. To learn more about our firm’s arbitration services – and other options for out-of-court litigation – contact us at 214-265-7630 to schedule an initial consultation. We offer cost-effective and efficient family law services that focus on helping you prepare for the next chapter in your life. Arbitration is an alternative to the traditional courtroom process. This form of alternative litigation has become more popular in recent years as divorcing couples seek cost-effective solutions to dissolving a marriage. During arbitration, a trained arbitrator – such as attorney Julie Johnson – is hired to act as the judge in divorce proceedings. You and your spouse can use arbitration to come to decisions on spousal support, division of property and debts, and more. Why choose arbitration over a traditional divorce? It saves time – A divorce that goes to arbitration isn’t subject to the roadblocks one may face in a typical courtroom process. There are no delayed hearings to worry about and you will not be beholden to court schedules. Providing an attorney with full case details at the outset can help to speed up the process even further. It saves money – You and/or your spouse will be obligated to pay for the services of an arbitration lawyer. However, the efficiency and relative speed of arbitration typically result in a less expensive divorce. It allows for more privacy – When you choose arbitration, you opt to keep your family’s private affairs out of the courtroom. This can provide an enormous sense of relief for those who are seeking a peaceful resolution to divorce. It is based on agreement – Arbitration is an agreement-driven endeavor. Instead of battling it out over every last detail, you and your estranged spouse work with the arbitrator to reach mutually satisfying decisions. It gives you more power in your divorce – In a traditional courtroom divorce, the judge is chosen for your case. In arbitration, you and your spouse have the power to choose your own Dallas arbitration attorney, which is akin to choosing your own judge. Arbitration is a beneficial option for many divorcing couples but it’s not appropriate in all cases. Our legal team helps you determine if your case is a good candidate for out-of-court litigation. If you’d like to learn more about arbitration, complete our online contact form or call 214-265-7630 to schedule an initial consultation with a Dallas arbitration lawyer. We do our best to keep our rates affordable and offer flexible payment plans.